And yet, for all our cheap tricks and shifty-eyed “explanations”, the truth remains: God’s words do not cease to be God’s words simply because they are hard words. 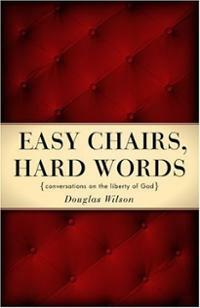 Pastor Doug Wilson makes this very case in his book Easy Chairs, Hard Words. Through a series of fictional conversations between a young believer and a seasoned pastor, Wilson delivers a cogent and beautifully-argued introduction to the Reformed faith, with both feet planted firmly in Scripture. 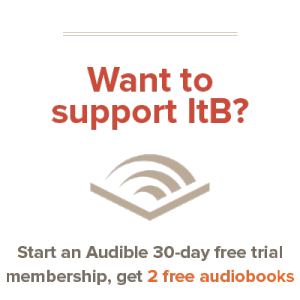 Beginning with the question, “Can salvation be lost?” he wrestles with a number of tough doctrinal issues, including free will, election, and original sin. One reviewer dubbed this book “the death of Arminianism in plain English.” An apt description, but it might give you the impression that this is a ham fisted attack on all things Wesleyan. Which it is – most emphatically – not. Wilson never stoops to acerbic language, nor does he adopt a smug tone. If you find that reading this book sets your teeth on edge, I would humbly submit that your problem is less with Wilson, and more with the Scriptural truth that Wilson teaches. You might want to think about that for a minute.